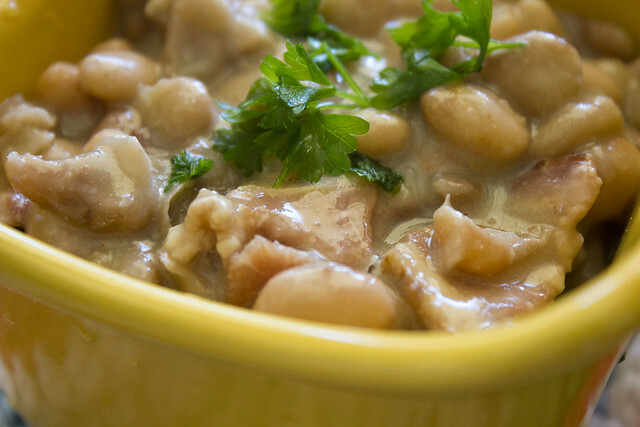 If you're looking for a quick and simple, but fantastic bean recipe, you have found it. 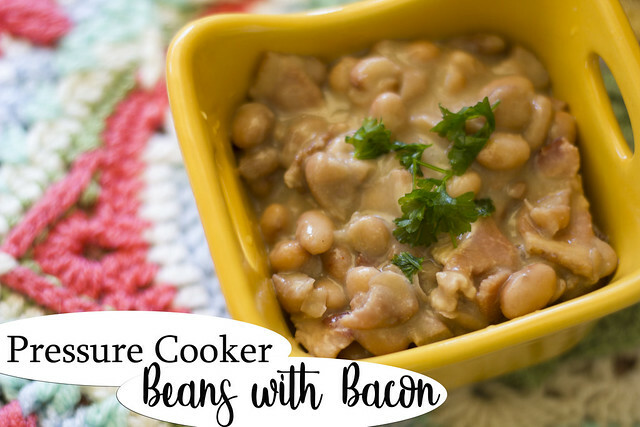 It is incredibly easy to put together and with the help of the pressure cooker, you will have fantastic flavorful beans, in no time at all. Wash your beans well, then soak in water overnight. Throw out any bad beans, little stones, or any beans that float to the top. Before cooking the beans the next day, give them a good wash until the water runs clear. Add a little drizzle of olive oil to the pressure cooker, and set to Saute. Stir in the garlic, salt and pepper and bacon and cook until crispy. Click the cancel on the pressure cooker. Next goes in the beans and the water. You need to add water to at least 2 finger widths above the beans. Some people add 3 cups of water for ever cup of beans, but I usually just do as I said above. 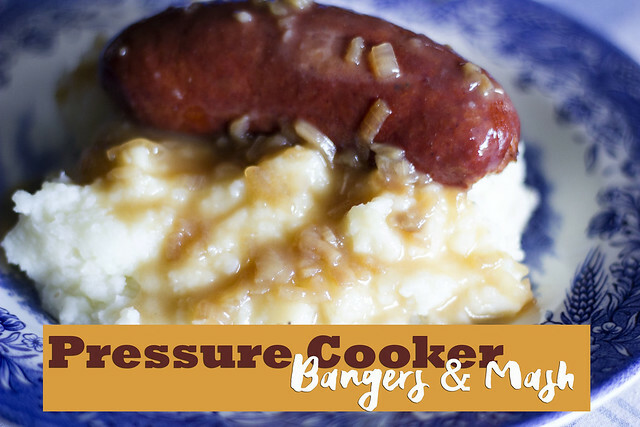 Set the pressure cooker to Manual High and cook for 35 minutes. When the time is up, do a quick release and check the beans. If they are not yet cooked, add more water and return to the pressure for another 10 or so minutes. 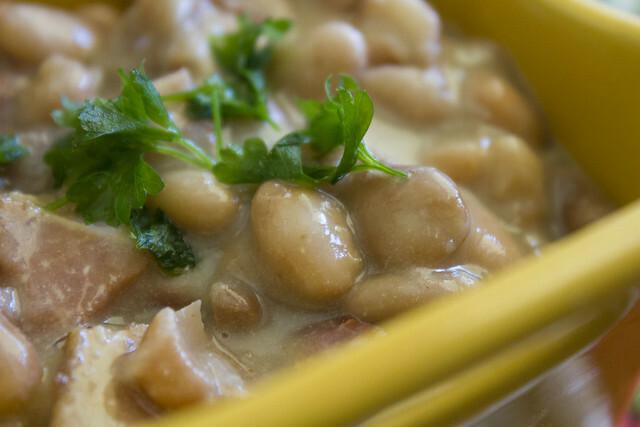 I don't usually have a problem with the beans not cooking, especially the pinto beans. You will notice at this point that the beans may seem kind of runny, at this point I turn the pressure cooker back to the Saute function, mix a tablespoon of cornstarch with a little bit of water, and add that back into the beans, stir and let it cook until thickened. You can recheck the seasoning at this point, add more salt if needed. I love food, always have and I think I always will, and I may sound very biased, but without a doubt, for me, one of the best foods on earth, is Portuguese. You may say that I only think that because I'm Portuguese, but that's not necessarily true, seeing that I also think Mexican, Chinese, Indian and Italian are some of the best too. 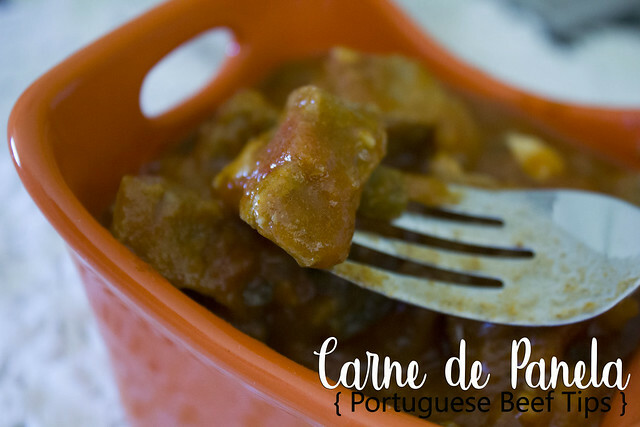 For me though, growing up in a Portuguese home, learning to cook from a very young age and being surrounded by flavor, fresh ingredients and nothing but the simplest of homemade meals, created a love for real comfort easy dinners. I was never one for gourmet, never one for expensive or intricate recipes or exquisite weird ingredients. Cooking needs to come from the heart, and most importantly from your home and what you have on hand. A little of this, a pinch of that, and a finished dinner that will stick to the ribs and leave everyone asking for more. 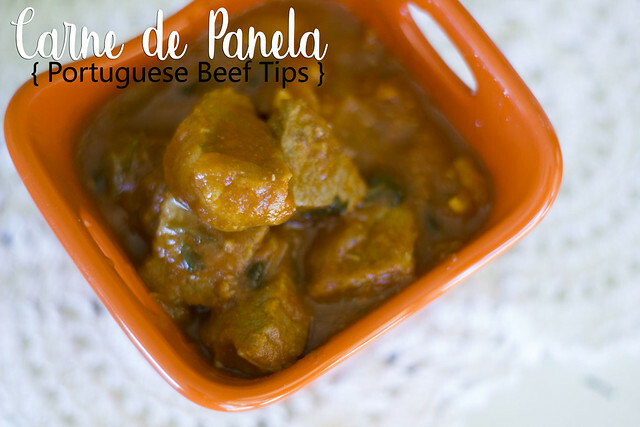 The recipe I'm sharing with you today is one of the simplest ways to prepare a pot of beef tips that can be served with mashed potatoes, or rice, pasta, whatever your heart desires. Using a mortar and pestle, crush the garlic cloves along with the salt, paprika and chili flakes. In a pot, add a little bit of olive oil and the garlic mixture you just crushed. Stir, then add the beef cubes. Cook over medium heat until nicely browned. Next, add in the rest of the ingredients and mix well to combine, check the seasonings and add more salt if needed. Cover and let cook over medium heat until meat is tender and the sauce has reduced to a nice thick gravy. Y'all......mug cakes are one of the easiest and most versatile recipes to keep on hand. You know how sometimes you get a craving for something sweet, but you don't want to have to whip up a whole cake? This is the perfect way to get rid of that craving, and since the possibilities are endless, you can do chocolate, vanilla, caramel, whatever you want. 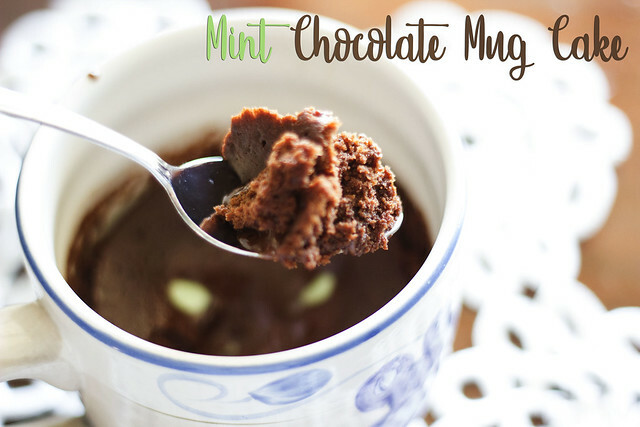 This Mint Chocolate Mug Cake came about last week, when I was craving chocolate and had none on hand. It turned out SO SO good and definitely hit the spot. In a big mug, add all the ingredients and give them a good whisk to make sure everything is incorporated. Add the mint chocolate chips to the middle of the cake batter. Don't mix, don't stir, just drop and leave it alone. Microwave on high for 70 seconds. Carefully remove from microwave and enjoy. This truly is the fluffiest, softest and moistest mug cake, you will ever have. 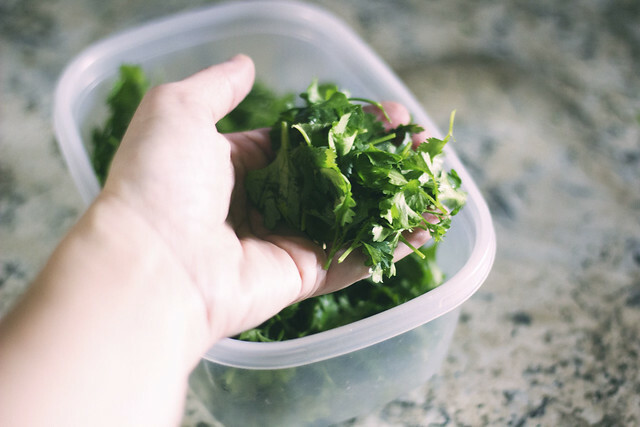 It's no secret that one of my favorite kitchen gadgets, has been my pressure cooker. The versatility and the endless ways we can prepare food in it, is by far one of the best investments you could ever make for your kitchen. I received mine two years ago for Christmas, and I've actually requested another one for this year, that's how much I love mine. One thing I find quite a lot of fun to do, is adapting recipes from the oven or stove, to make in the pressure cooker, I just find that it cuts down cooking time dramatically and sometimes, when our days are super busy, it really helps get a good home cooked meal on the table. Turn the pressure cooker on to Saute, and then add a drizzle of olive oil, add the sausages and cook until brown. When done, pour in the cup of water and the packet of onion gravy mix. Press the cancel button on the pressure cooker. Pop on the lid, make sure the valve is set to seal, then cook on Manual High for 6 minutes. As soon as it is ready, click cancel/keep warm, and do a quick release of the steam. I like to pop on a kitchen towel over the valve when releasing the steam so it doesn't sputter everywhere. If the gravy is very thin, you can turn on the saute feature again and add in about a tablespoon of cornstarch, mix it well to avoid clumps and let sauce thicken. While stationed in Arizona, we came to find a ton of amazing restaurants, and to this day, some of our favorites remain in Phoenix, AZ. It is one of the reasons we are looking to visit sometime next year. One such place was Ono Hawaiian BBQ. Their food was so good, but so good, that we went back constantly. I only wish there was an Ono's in Texas, but alas, there isn't. 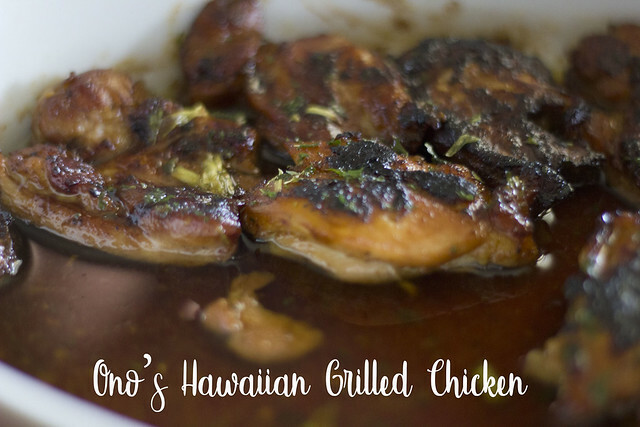 So with that in mind, I went on the look for copycat recipes that could recreate this wonderful food, and found one for our favorite chicken, so I thought I would share it with you. If you have an Ono's nearby, I highly recommend checking it out. By the way, the proper way to make this chicken is by grilling it, but I adapted the recipe to use my cast iron skillet instead. In a bowl, mix the brown sugar and soy sauce together. Add in the garlic, ginger and onion. Pour the mixture into a ziploc bag, add the chicken thighs, make sure the bag is closed tightly and then give it all a good shake. Let it marinade for a few hours, or even overnight. Heat up a cast iron skillet with a little bit of butter, add the chicken thighs and cook until brown and cooked through. In the meantime, place a 13x9 inch casserole dish in the oven, at about 250 degrees F. Add a stick of butter and let it melt. As the chicken gets done, transfer to the casserole dish and keep it in the oven where it will be swimming in all that buttery goodness. Once all the chicken is done, cut up some green onions and add to the chicken.